Every baby is striving to sit up and see what’s around them, it’s a primal instinct and shouldn’t be ignored. There are new and innovative baby toys and stuff that’s been tailor-made to ensure that your child can develop their strength and grow. This review looks at different seats that can help that, so you will no longer need to be propping them up with pillows and keeping an anxious eye on them. Some components of the baby seats are not as sturdy as others and although this is uncommon, making sure they are designed by a well-known company is important to us. We choose safe and trusted sites like Amazon to ensure supreme product quality. Each seat offers slightly different features and styles, so choose one your child will love. Some noticeable differences are whether they are flat sitting surfaces, supported leg position and have a chest-level support feature which is a favorite of many. ASTM international offer approval-only on products up to standard and partners with the JPMA, which makes sure the manufacturing process meets the regulation standard, also ensures your child is safe in play with high quality finished items. The easy to assemble is always best and the quicker is usually a sign of well-made baby products, which is why in this review I choose Fisher-Price. They are easy to assemble and you will find it easy to handle unlike some I have come into contact with over the years. 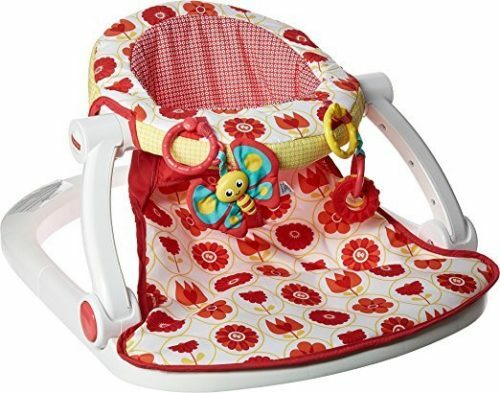 In this infant floor seat review, my aim is to show you some of the slight differences on the market and try to get you the parent the best deal without the countless hours of research because that’s what a good review aims to do. The baby floor seat reviews are designed to show what is possible and on the market both to highlight bonus features and subtle differences. 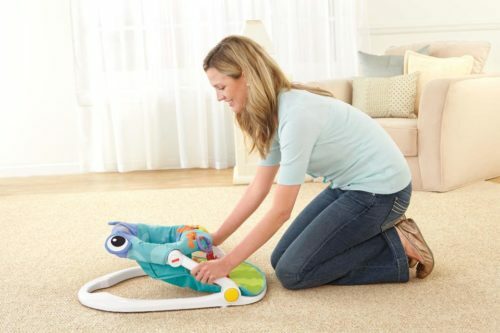 Sometimes choosing the right seat that helps baby sit up is difficult and time for a specific toy, tool or device can be tricky and if the manufacturing guidelines don’t state the advisable age use, then this is maybe something to either query or question because most distributors should do this a standard practice. Safety is always paramount and should be the first consideration in choosing anything, but once this is satisfied then it’s about making sure you have the right age of use for the child. This review is focusing on infant floor seats, which are usually used from the ages of 3 months up until 8-9 months, but some have been designed for extended use. 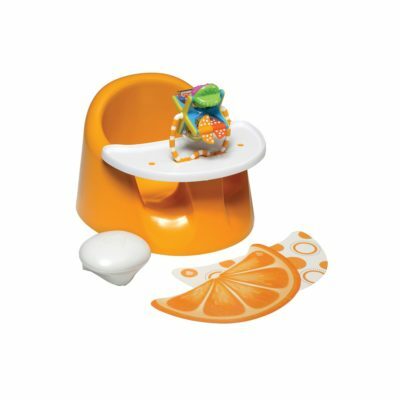 This is where your child begins to learn their table manners and with this baby seat they can be comfortable while building strength to learn to sit upright and support their little head. The design of this product is made from plastic and is imported and is safe with comfortable padded seating, so they can maintain comfort while seated for prolonged periods. The size and durability mean this can be used for travel and taken to the relatives for family visits for the child to see their grandma. The strap means that they are secure and safe. The feeding tray is large and means play time and feeding can be done together. The tray is removable, lightweight and easy to wipe, so high levels of hygiene can be maintained throughout. The baby in this picture looks adorable and content, simply enjoying seeing the world from another point of view, which is essentially what we are all trying to do as well, so that being said this little seat for babies trying to sit up is a great introduction for this review to shed some light on the available options, both pro’s and con’s. The infant sitting chair is supportive in structure and has been designed to ensure utmost support without impacting on their natural anatomical development. This seat is extremely comfortable and offers support at the right key points, which helps maintain their happiness for prolonged periods throughout the day, it’s really ideal for a mother who has loads to maintain at home. This top baby chair is wide and supports well with a wide base to help with stability, especially if they have the tendency to be really stretching at the later stages of the seats use (8-9 months). The toys are great for keeping them entertained as well as help with their hand-eye coordination, which will be stimulated and assist with early stages of development. The frog design is pleasing to the eye and helps with keeping in line with the cute theme. This chair is extremely mobile and offers an easy to carry handle, which comes in handy when on the move, out for lunches or trips away to see extended family. This amazing infant floor seat is comfy and has a particular soft fabric that is easy to clean and helps cushion them so they’re snug and supported. This awesome baby chair has really neat speakers that activate when your child presses on them, which might encourage them to actively use their legs and help build strength over time, which is one of the main reasons for these great supportive baby seats. 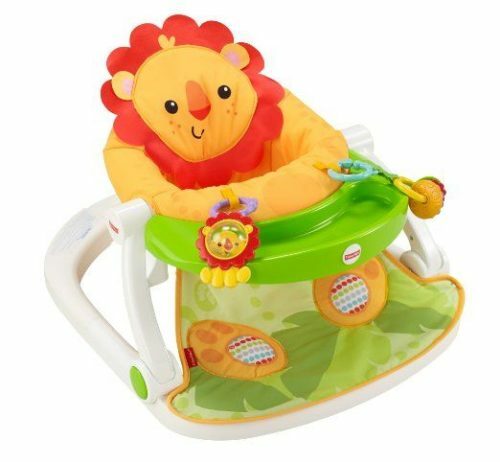 This lion baby seat has a couple of toys and can be used for supporting the development of your child, especially at the teething stage, which is handy because any other toy would be thrown on the floor without the tie-on-feature. The tray on this infant seat is ideal for them to get used to feeding on a toddler high chair and promotes early development, but also simply just have a tray to place things for them to touch and get used to feeling new things, seeing fanciful objects etc. The tray is also removable and is handy for when it’s not needed. Sounds and connections are important for the little ones, it is the process of understanding the world around them and being able to make decisions based on their environment, which is constantly changing, so linkable toy feature helps stimulate this and is awesome. This cheeky monkey is sure to get your baby monkeying around with a supportive infant seat structure, it’s extremely snug in design and won’t drop him from the high branches above. The upright seating position means that they can see the world around them and begin to create gradual understandings of what is coming and going. The foot pads are again super cool and make learning loads of fun for your baby, especially when the monkey begins. The speakers make a soft but firm sound and allow for some gentle stimulation while being safe and secure. The link-able toys are imaginative and give hours of playing, touching and chewing for those early learners. The removable cover makes for cleaning super easy and for those messy babies and worries mothers, fret no more it’s been taken care of. This is highly mobile and easy to transport, so no matter the journey it’ll be an easy companion. 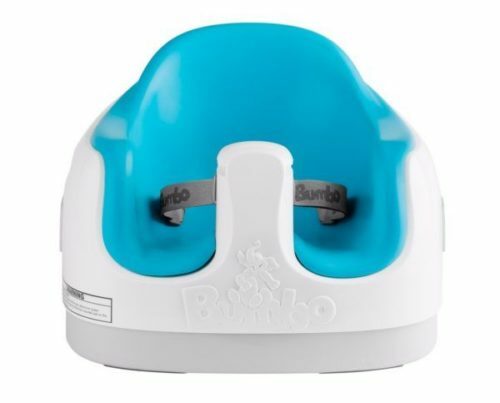 The Bumboo is the latest in design for babies and has a 3-in-1 feature that allows it to be a floor seat, booster and can be used for a feeding seat as well. This is the only one in the review that can be used for all purposes. The 3 point harness and overall stability is both solid and secure, which means that feeding time will remain seated, although I cannot promise about the food. The seat is padded with foam and can be comfortable for your child for hours at a time, so you can get on with the growing number of tasks to be done. This comes with a tray for feeding and a wide base for handling the rocking movements that some children like to make. The wide base increases the seat stability and handles any type of vigorous behavior, but be warned some children find their way into releasing the harness, but very rare. This is another 3-in-1 design and can be used for each stage in their development, from support seat to being strapped to a chair. There is a snack chair with different activities that keeps them entertained and helps with developing hand-eye coordination. The seat has a tray that can rotate 360 degrees and makes rotation easy for accessing the toys. The tray pivots and can be released with a release of a button, so each time mom needs to lift in and out, its quick and easy. The tray latch is important to be easy to use and some designs have let parents down with stiff and awkward to use devices for releases and fascinating, however, this is easy to use and functional. 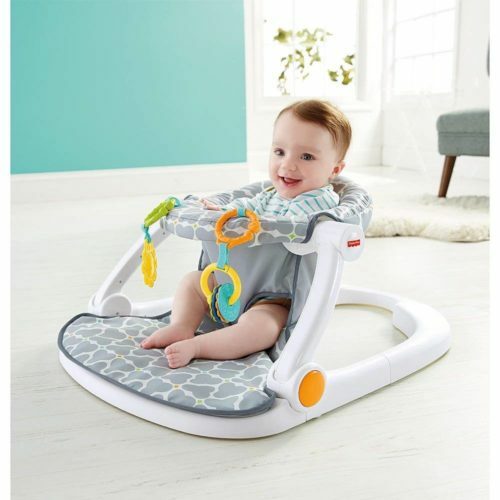 This is a good seat for babies learning to sit up and the more support they need it can offer, but as they become stronger in upright posture the baby einstein releases so they can grow with comfort. These 3 modes are ideal and this is where the future of floor seats seems to be heading, so save money and time by investing in the 3-in-1 design, regardless of which type. 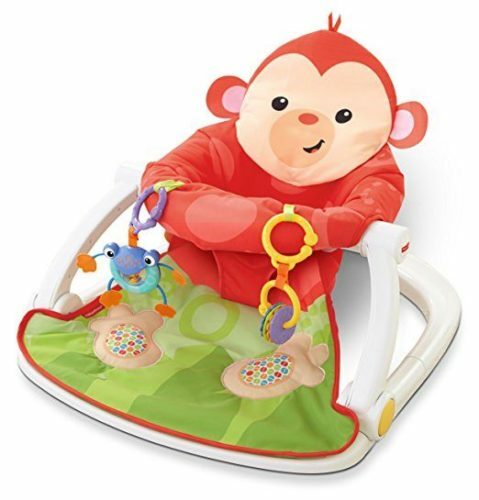 While all help to sit up and get the little ones well on their way to becoming toddlers there is one that stood out “Deluxe Sit up Floor Seat Monkey”, which has all the essential features a parent would want from a sit me up chair for infants. The Speakers sound when pressed, toys are chew-able for teething and the washable cover is ideal for messy children. Every infant seat needs to have some essentials and this sit me up infant floor seat is cheap compared to some of the others in this review, but still has some great core features like; soft cushioning, toys to be chewed and plenty of room for them to explore. This is a highly mobile infant seat and offers similar features to all the chairs in this review, it’ll offer a great transitional seat to ensure they manage to sit up and progress to the next stage.